Voorhees resident Harry Maddox (left) fills his bag with produce at the Virtua Mobile Farmer’s Market. Also pictured are employees Greg Mayers (center) and Cordell Boyd. It is estimated 70,000 people in Camden County live in food insecure households. The Virtua Mobile Farmers Market is looking to decrease that number. 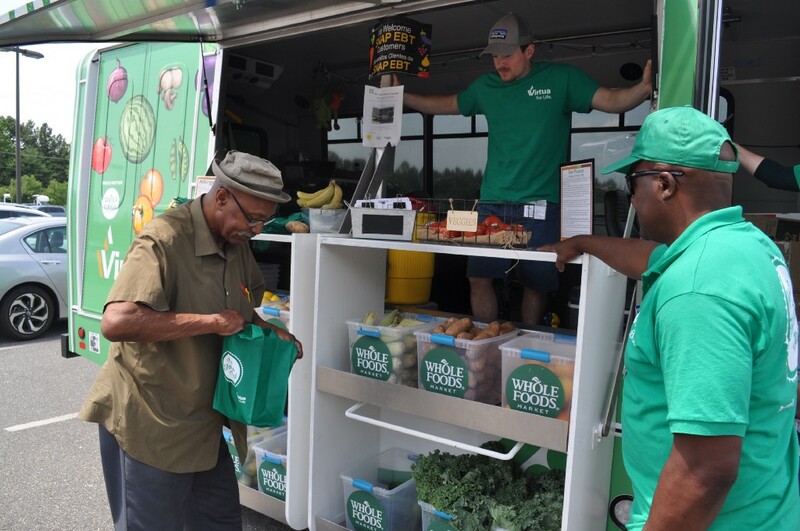 The new 23-foot bus rolls into underserved South Jersey communities five days a week, bringing fruits and vegetables to those who may otherwise not have easy access to fresh produce. The market stops by Voorhees on Thursdays from 2 to 4 p.m. at Virtua Voorhees, 100 Bowman Drive, Parking Lot A.
Virtua is also working with registered dieticians to provide health education, recipe cards and nutrition information in addition to the opportunity to purchase deeply discounted fresh produce from a mobile market site. Voorhees resident Nancy Weiner (right) and Virtua Mobile Farmer’s Market employee Cordell Boyd check the freshness and aroma of the lemons. “All of our recipes use ingredients directly from the bus,” Ghee said, adding they make sure recipes don’t call for specialized kitchen equipment. The produce is purchased from Whole Foods at a wholesale rate, and then is discounted 50 percent more. A family of four can shop and fill up a bag for $8. If a family is on New Jersey’s Supplemental Nutrition Assistance Program, they can get an additional 50 percent off the price, bringing the price of a bag down to $4. There are also three bag sizes to cater to different sized families. 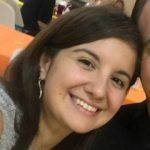 Ghee came up with the mobile market idea about a year and a half ago when she attended a conference with the New Jersey Hospital Association. Innovative outreach ideas by health systems were discussed, and around the same time, Ghee read a report put out by the state that expressed the need to address food insecurity in southern New Jersey. The market serves locations in Camden and Burlington counties. It went live on April 29, and the first day in the community was May 1. Ghee stressed they work to educate consumers this is meant for those people who cannot normally access and afford regular food store options. So far, according to Ghee, the market has been a success. The first week it stopped in Sicklerville, for instance, there were people wrapped around the parking lot waiting and produce sold out in 60 minutes. The second week, they doubled the produce for the Sicklerville stop. “We’re just learning as we grow,” Ghee said. Virtua is doing data collection at every site. In its first month from May 1 to 31, the mobile market distributed 3,300 pound of produce and served 1,114 families, visiting seven sites a week. Seventy percent of its shoppers are women and children. Surveys are distributed to customers to help Virtua measure behavior change in driving down food insecurity and addressing chronic disease, such as diabetes and hypertension. To learn more about the Virtua Mobile Farmers Market, please visit www.virtua.org/mobilemarket.